Many homeowners put off replacing a roof for as long as possible, and we get it! It’s a big investment. Although basic roof maintenance and responsible homeownership can certainly help extend the life of a roof, there will eventually come a time for it to be replaced. Of course, the best time to replace a roof is before it starts causing problems. Replacing a roof is like replacing the tires on your car. If you wait too long, you’re just going to have to spend more time and money to correct greater damage. And even then, you’ll be lucky if you avoid a disaster! Having a good idea of the age and condition of your roof can help you plan for when it should be replaced. This way, you’ll be sure that the roofer of your choice has the availability to upgrade your roof, and you won’t be stuck waiting until they can fit you in to their schedule. What’s more, is that you’ll likely avoid other damage caused by a roof that’s too far past its prime – rotting drywall, mold, and even structural damage. 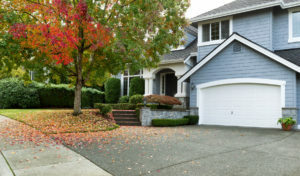 Most roofing companies are busiest in the late summer and early fall months. This is when the weather starts to cool down, and the rainy season has usually passed. One of the main concerns for roofers is the possibility of rain or moisture making its way inside the home. In summer and fall months, this usually isn’t as much of a concern as it is in winter or spring. Of course, here in Indiana, the weather can be unpredictable year-round, but in general, late-summer to early-fall tends to be the best time to replace a roof. One downside to replacing a roof in warmer months, though, is that as the sun heats the shingles, they become more malleable and nails can slide right through them. Do your research and make sure that you are hiring a company with a good reputation and plenty of experience. Malleable shingles are no problem for an experienced roofer who can control the force of his or her nail gun but could pose problems for someone with less experience. You probably don’t see a lot of roofing projects in the winter and spring months, but that doesn’t mean that it isn’t possible. Like we discussed earlier, one main concern is rain and moisture getting under the shingles and into the roof. This is more likely to happen during the rainier months, so being flexible with scheduling is a must with any outdoor construction job, and even more so in winter. Another consideration for roof replacement during the cooler months is that most new shingles need to undergo thermal sealing, which happens best in temperatures higher than 40 degrees Fahrenheit. Even in higher temperatures, it can still take several weeks for the process to be complete. One benefit of scheduling a roof replacement in the cooler months is that roofers are often less busy, and you usually won’t have to wait so long for availability. Depending on your geographic location, you can often find building materials cheaper during off-season months as well. If you are concerned about the health of your roof, scheduling an inspection today can only help you avoid issues down the road. E3 Roofing & Remodeling offers free roof inspections, so you will know if your roof will last another ten years, or only another season. Taking advantage of a free roof inspection can help plan the best time to replace a roof and help you avoid bigger issues later on. Click here to schedule your free roof inspection. Connect with us on Facebook, submit this online contact form, or give us a call today at (317)899-9132. We are eager to hear from you!